Summary: On the morning of October 12th, Urtrust Think Tank expert Li Ruibin and his entourages, accompanied by Jining Association For Science And Technology Vice President He Bo, Jining High-tech Zone Trade Union Vice Chairman Wang Naiting, Shandong Province Internet Media Group Jining Branch Financial Firector He Xin, Jining Electronic Information Association Secretary-General Liu Xiaoling and other leaders, visited China Coal Group for investigating on the enterprise information security training and other aspects, China Coal Group Executive Deputy General Manager Han Yong, Li Zhenbo, Deputy General Manager Fan PeiGong, Guan Chenghui, Li Zhaopeng and other leaders accompanied the reception. On the morning of October 12th, Urtrust Think Tank expert Li Ruibin and his entourages, accompanied by Jining Association For Science And Technology Vice President He Bo, Jining High-tech Zone Trade Union Vice Chairman Wang Naiting, Shandong Province Internet Media Group Jining Branch Financial Firector He Xin, Jining Electronic Information Association Secretary-General Liu Xiaoling and other leaders, visited China Coal Group for investigating on the enterprise information security training and other aspects, China Coal Group Executive Deputy General Manager Han Yong, Li Zhenbo, Deputy General Manager Fan PeiGong, Guan Chenghui, Li Zhaopeng and other leaders accompanied the reception. Urtrust Think Tank is the first high-tech enterprise in China to focus on the "13th Five-Year Plan" and the industry information security solution. It is also the first consulting firm to be listed in the "National Double Plate". The company mainly adopts business mode "Consulting Planning and Design + Information Security Implementation + Innovation Venture Investment", relying on the National Development and Reform Commission, Ministry of Industry and Information Technology, Ministry of Science and Technology as a strong resource platform, with its own government resources and professional technical ability and other competitive advantages, commit to provide planning and design for government in industrial transformation and upgrading, Big Data, network security, Industry, Smart city, Characteristic Town and Management Promoting, Investment&Financing and other modern consulting services for enterprises. Accompanied by General Han and Li, the visitors and his entourages visited China Coal Group office building, Group culture exhibition hall, intelligent product exhibition hall, Jining Industrial And Information Commercial Vocational Training School trainning room, E-commerce Company, Cross-border E-commerce Company, Network Information Company, Software& Technology Company, Weixin Agricultural Technology Company, Kate Intelligent Robot Company, etc. 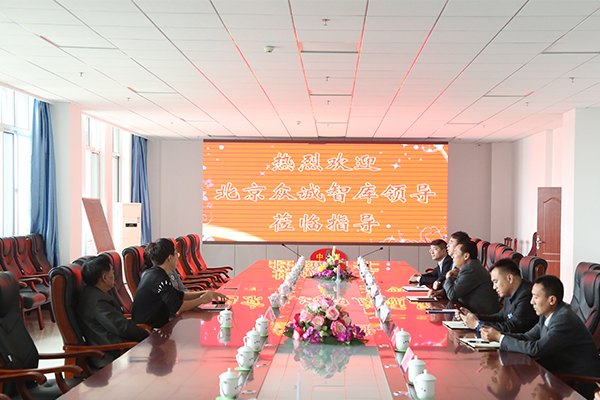 During the visit, G. Li made a detail introduction about our developing condition in e-commerce, Information security, Big Data construction, intelligent terminal equipment manufacturing and new industries field, and highlights the developing of Jining Industrial And Information Commercial Vocational Training School that invested and founded by the Shandong China Coal Group. The visiting leaders gave a high praise to our developing achievements. 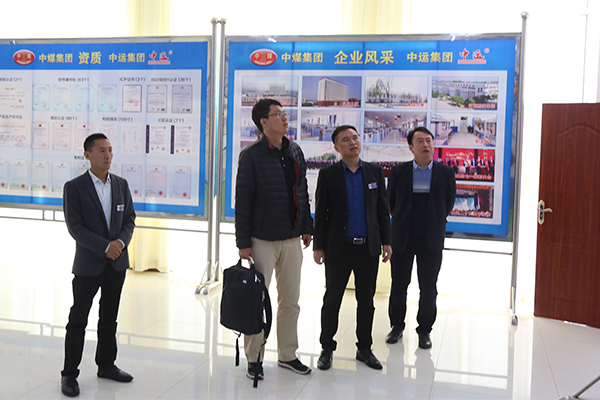 At the symposium, many leaders and experts fully affirmed on our achievements in the enterprise e-commerce, Big Data construction and enterprise information security construction, highly appreciated the outstanding contributions of Jining Industrial And Information Commercial Vocational Training School in promoting public entrepreneurship, training elite. 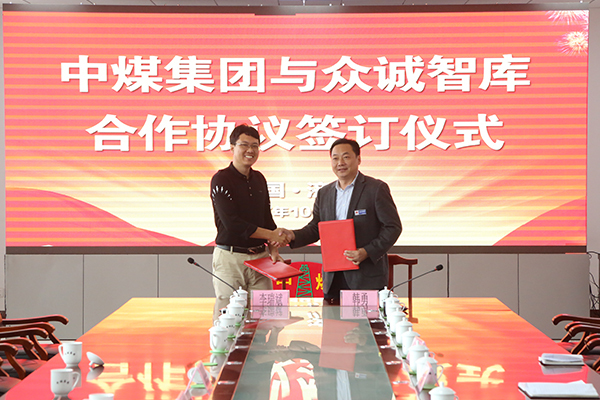 Urtrust Think Tank experts said that China Coal Group as a leading enterprise in Jining City and Shandong Province in the field of e-commerce, established a benchmark for the traditional enterprises in how to rapidly transforming to a modern information technology enterprise, the development and achievements of Jining Industrial And Information Commercial Vocational Training School in the Internet elite training walk in the forefront of the whole province, made a positive contribution for the traditional enterprises to the rapid transformation of modern information technology industry. Urtrust Think Tank, as a leading domestic high-tech Enterprises, focused on "government decision supporting" and "intelligent manufacturing system information security" , but also a professional information security industry and innovative business base operators, with a strong background and resources. Urtrust Think Tank has obvious advantages in the faculty strength, training experience, we hope that the two sides will build a win-win and sustainable strategic partnership through deep cooperation on the basis of equality and mutual benefit and complementary, and adopt a unified resource integration advantage to form a long-term common development alliance to further enhance the brand value of both sides and get a good economic benefits to achieve the development of both sides of the win-win! 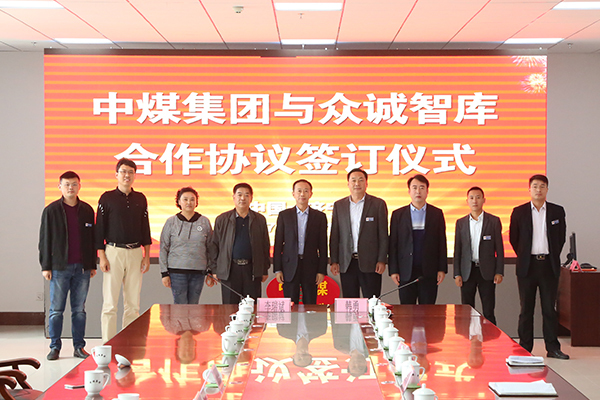 Finally, The Strategic Cooperation Signing Ceremony between China Coal Group and Urtrust Think Tank was held grandly. 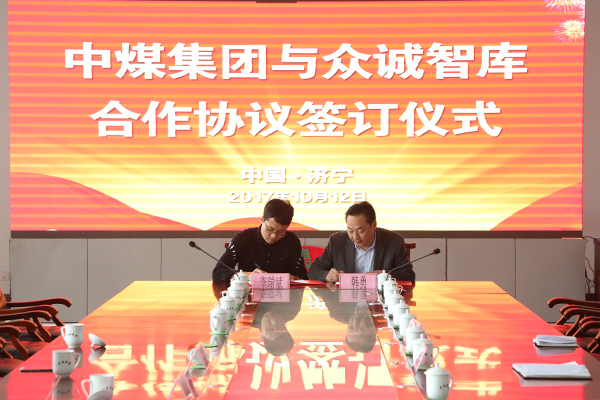 China Coal Group Executive Deputy General Manager Han Yong and Urtrust Think Tank expert Li Ruibin signed a strategic cooperation agreement, the two sides leaders took photos for memory. G. Han said that after reaching the cooperation with Urtrust Think Tank, we hope that the two sides could share resources, acceive a powerful combination, through the platform ofJining Industrial And Information Commercial Vocational Training School, provide more services to the government and enterprises for making more contribution to the innovation and development of national industrial enterprises!